Archie: More, he has more... I didn't have no million people marchin' and protestin' to get me my job. Archie Bunker (Carrol O'Conner) was the product of a bygone era. Bigoted, self-centered and ignorant; anything that didn't directly benefit the king of the castle was open to criticism, derision or spite. Difference was something to be shunned and looked down upon, and what the difference was didn't really matter; gender, race, creed, religion, or ethnic origin all garnered the same derogatory response. The 1960s turned his world on its head, as the issues of equal rights came to the forefront, and the world was forced to confront its prejudices. An American remake of 1966's Britcom 'Til Death Us Do Part, Norman Lear's ground-breaking television series, All in the Family, put a face on bigotry in the form of Archie Bunker. He was an uneducated, working class stiff, firmly entrenched in his traditional world view, trying desperately to hang on to the "good old days." At his side was his wife Edith (Jean Stapleton), a woman a few bricks short of a full load, but one who didn't necessarily share his views, primarily because she'd never had cause to think about them. The voice of conscience came in the form of their live-in daughter Gloria (Sally Struthers) and her student husband Michael Stivic (Rob Reiner), both of whom were ready to take up the causes of their generation and fight for the rights of others, even if it meant calling Archie a bigot. Despite Archie's extreme political incorrectness, he was not the kind of character the audience was led to hate, as his was not a vindictive personality, but an ignorant one—he simply didn't know any better. While he would petition to keep the "unwanted elements" out of his neighborhood, he wasn't one to be burning crosses or inciting violence. Archie simply wanted things to remain as they had been in the past, where his own self-importance wasn't challenged. But the Stivics would have none of that, and the series did an excellent job of addressing the issues of the day, allowing Archie to express his outdated thoughts by defending them with inane arguments that were the heart of the show's humor. Archie's lexicon of racial and ethnic slurs was boundless, and were the some of the few things in the English language he could get right. In spite of Archie's prejudices, the show didn't take the easy road and leave him as the sole bigot in the sea of humanity; instead, it introduced like-minded characters from all walks of life. The Jefferson family, whose son Lionel (Mike Evans) is introduced in the pilot, would have their own prejudices, though we only get an introduction in the first season. Lionel's character is a key role, being of Mike and Gloria's generation, he is the voice of the black people in Archie's ear, hamming up the stereotype, while playing Archie for the fool in the process. There was no subject that was taboo for the series, which drew in 50 million viewers each week. It was a ground breaker, which is as relevant today as it was thirty years ago. Mike and Gloria set up a surprise brunch while Edith and Archie are out at church on their wedding anniversary, an occasion Archie has forgotten about. When he uses a Jewish euphemism, Archie takes a ribbing from Mike and Lionel, who have Mr. Bunker defending his position as a "non-Semite" as we Meet the Bunkers. Michael drafts a letter to the president of the United States airing his concerns over the state of the nation. Afeared at what his meathead son-in-law might be saying to the Commander-in-Chief, Archie insists on Writing the President himself, enlisting Edith's help to draft it. Archie gets in a minor fender bender, but its severity increases once he hears Lionel's tale of his parent's substantial windfall from an insurance settlement. Archie insists on a Jewish lawyer to represent him, but instead, the firm of Rabinowitz, Rabinowitz and Rabinowitz sends out their token gentile in Oh, My Aching Back. Salem Ludwig, George Furth and Richard Stahl costar. The Stivic's friend Roger (Tony Geary) is coming over for lunch and Archie has him pegged as gay. While Edith expouses her intrigue with photography, Archie heads to Kelly's to hang with the boys, including his buddy Steve (Philip Carey), who used to be a star linebacker. Mike is let in on some information that will cause Archie to rethink Judging Books By Covers. Also costars Bob Hastings, Bill Halop, Billie Sands and Linn Patrick. Archie: A man is rich who can enjoy himself in the bosom of his family. Mike: You sure are shovelling it tonight, Archie. Edith: A man is rich who can enjoy himself, you know who said that? Marcus Welby. Mike convinces Archie to go to the blood doner clinic, which sparks a series of conversations about racial equality, and Lionel has some fun at Archie's expense when Archie Gives Blood. Gloria finds out she's pregnant and the news goes over like a bomb in the Bunker household. Mike decides to drop out of school and get an apartment, while Archie has to come to terms with the prospect of a new arrival in the family. This episode is the first to show the excellence in the dramatic side of the series, and puts Archie's character in a new light in Gloria's Pregnancy. Mike: You know, you are totally incomprehensible. Archie: Maybe so, but I make a lot of sense. Mike's Hippy Friends Come to Visit and Archie flips a bird when the unmarried couple are set to stay the night in the Bunker household. Archie extolls the virtues of the marriage licence, but meets opposition from the guests who have their own views on the validation of a relationship.Jack Bender, Corey Fischer and Jenny Sullivan costar. When a black woman shows up at the door asking for the keys to the neighbor's newly sold house, Archie is worried that the former owner has sold out to the "wrong kind." Isabel Sanford makes her first appearance on the show as Mrs. Jefferson, and Vincent Gardinia costars. Mike: Do you believe in capital punishment, Ma? Edith: Well ,yeah, I guess so. Edith: Well, so long as it ain't too severe. Edith gets chosen for jury duty, and Archie feigns ill to get her to back out of it, but Edith takes her civic duty seriously, even when it means she is sequestered for an important murder case. When the family finds out a lone juror is holding up deliberations, there can be only one person to blame. Doris Singleton, Holly Irving costar. Edith: Even in bed you didn't sleep. Archie: How did you know that? Edith: Because when you sleep, you snore and kick, and when it's very quiet and I'm not gettin' hurt much, I know you ain't asleep. There's no sleep in the Bunker household while Archie is Worried About His Job. His company is cutting back, and he is awake waiting for news from Feeney, the night watchman, who is supposed to sneak a peek at the short list of layoffs. The night becomes even more eventful when the rest of the family join in the vigil. Costarring Holly Irving, Burt Austen, Sandy Kenyon, Jack Perkins. Archie: Mike? It ain't enough that he's a Pinko and an Atheist, you're gonna turn him from a man into a morphadite? Archie: A freak. With a little too much of each and not enough of neither. All hell breaks loose when Gloria Discovers Women's Lib. Not only is she upset with Archie's treatment of her mother, but Mike 's take on the equality issue isn't going down very well either, leading to an explosive argument and Gloria packing up and leaving. This is the first time we see upstairs. An old army buddy who has become a millionaire shows up and Archie hosts a reunion. Archie is honored that the man still remembers him, and wants his family to meet him. But Eddie Frasier's (William Windom) Success Story doesn't apply to his own son, who wants nothing to do with his father. Features the first ever prime time TV "turlet" flush. Guest stars Len Lesser, Herbie Faye, George Savalas, Frank Ford. Archie: Well youse two may have come from monkeys and bamboons, but not me. The Lord God created me in his image. Mike: You mean God looks like you? Archie: I ain't saying you couldn't tell the two of us apart. Mrs. Jefferson invites the Bunkers for dinner, and Edith accepts, but is nervous to tell her husband. When Archie finds out, hIs reaction is as expected, and he fabricates a lie to get out of the engagement. When Lionel confronts him, Archie gets a taste of his own medicine, when he finds out Mr. Jefferson is as prejudiced as he is. Costarring Mel Stewart, Bill Benedict. Advertised as "videotaped before a studio audience," the episodes contained herein suffer from the effects of the non-film format, and the majority of defects can be attributed to the source. Colors tend to be somewhat undersaturated, and often on the green or pinkish side, and picture extremes have distinct color shifts. Contrast and black levels are reasonable, and shadow detail is marginal. The image occasionally stutters or has dropouts, and there is a distinct and unnatural grain appearance. While not as clear and colorfast as I would have hoped, compared to other videotaped series from the era, this one has survived fairly intact. The mono soundtrack is in reasonably good shape, and any defects are attributable to the technology used for recording, and the storage of the elements in the intervening years. There is some hiss and distortion in places, and frequency range is understandably limited, and a bit of pre-echo on occasion. Dialogue, which was recorded on location, is easy to understand. This isn't an audio showcase, but gets the job done. Presentation of the three-disc set is about as lackluster as can be imagined. Packaged in a flimsy tri-fold cardboard case, the front cover picture is duplicated throughout. An episode guide lists the disc's content. The discs themselves have simple menus for episode selection and subtitle options. Each time the disc is inserted, an FBI warning will play before whatever episode is selected. Michael: You don't like anything about us. You resent our attitudes, our politics, even the clothes we wear. You know, I don't think there's one thing about us you agree with. 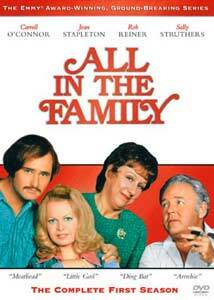 All in the Family is as important today as it was when first aired in the 1970s. Carrol O'Conner completely embodies the character of Archie, and his supporting cast is perfect in their roles as well. Mixing racial humor, poignant issues, and the sensitivity of human emotions, the show is a highwater mark in broadcast history, and deserves to be a part of any televsion collection. Highly recommended.